Does the Nordic model need to be reformed to face up to the challenges of globalisation? What exactly are these challenges and what are the causes which make the model work successfully, creating strong economic performances? Is the Nordic approach sustainable? Can its characteristic elements be used in other economies? Here are some of the main questions posed at the OECD conference "Embracing Globalisation in the 21st Century: a Dialogue about the Nordic Approach". "Inflation has generally remained low over the last three years, although as elsewhere, recent increases in food and energy prices are exerting upward pressures." Nordic countries’ tax and welfare systems have generally ensured that the winners from structural transformation have shared their gains with the losers - "Nordic countries have expanded the size of “the economic pie”, the distribution of this “pie” has been widely shared." "For example, in the Nordic countries, older workers’ employment rate in 2006 was well above the OECD average of 53%, reaching nearly 85% in Iceland." "Income equality and poverty rates were lower in Denmark and Sweden than in any other OECD country, and they were below the OECD average in Finland and Norway." "Taxation revenue to GDP last year was close to 50 per cent in Denmark and Sweden and over 40 per cent in Finland and Norway"
To what degree can the strong economic performance be attributed to the Nordic model? - whether the incentives associated with high taxes and a generous social security system are compatible with long-term sustainability. - a lower exposure to globalisation, in the sense that the export sectors are geared towards fast growing and relatively profitable products. "Finland and Sweden, for instance, specialize in the telecoms sector." - and their strong innovation frameworks. Is the Nordic approach sustainable? 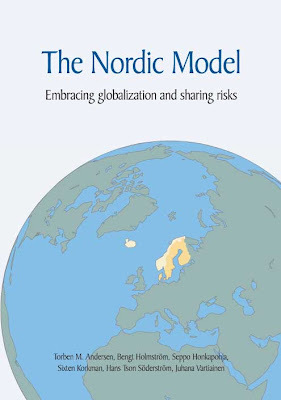 Moving on to the challenges, the Nordic Report  identified the risks for the Nordic model. The authors, six Nordic professors, focus on the implications of globalization and demographic change. The conference was organised against the background of the debate generated by this report. The authors think that the financial dilemma faced by the welfare state cannot be solved by increased growth, higher taxes, higher birth rates or increased immigration. - emergence of new players in the international trading system, bringing additional workers ( 1 billion over the last decade). - new relationships such as cross-border out-sourcing and in-sourcing. - many OECD-based businesses are setting up R&D operations in China and India, attracted by their abundant supply of highly skilled scientists and engineers. - expected demographic changes, leading to a higher proportion of retirees relative to the number of workers, as the baby boom generation retires, and life expectancy continues to lengthen. - governments’ room for manoeuvre has become more limited, with taxation levels already high, and tax bases becoming more mobile (especially on capital and labour income). Both forces exert tensions on the long-run sustainability of the Nordic model. "How can the essentials of the Nordic model be preserved going forward, especially its underlying philosophy of collective mechanisms for sharing risks? " Can elements of the Nordic approach be transferred? Are there lessons for other countries that can be drawn from the Nordic model? Certainly (second OCDE). - regulation does not buy security; in fact, the opposite appears to be true. - to caution against trying to emulate directly the Nordic model. The precise balance between the different policy planks depends on country circumstances and institutions. "For example, the quality of industrial relations, and agreement among trade unions and employer organizations on common objectives may play a key role in labour market performance, as well as the political feasibility of reforms. Establishing how countries can implement coherent policy packages in practice also takes time. The Danish version of the Nordic model, for example, is the result of a long series of reforms, started in 1994 and has required considerable fine-tuning to reach its present format." "Coping with globalization is about coping with change, and success in implementing policy reform requires winning broad support for change. But as you are well aware, that is not an easy task. There are winners and losers across countries and within each country. Even if a country benefits overall, the adjustment costs cannot be ignored." The actual dominant ideology of global capitalism - designated as “neo-liberalism” by some and “open trade” by others - has its proper strong discourse to impose the program of “creative destruction” of collective structures contrary to the market logic, across the world. Through agencies such as the OECD, “neo-liberalism” promotes the economics of the free market like an incontestable scientific theory - a logic of flexibility, competitiveness and extreme individualism that has no alternative. Indeed, the OECD is not ideologically neutral and, like other transnational bodies, it has the corporate speak characteristic of the corporate world. We know that the compatibility between a true reformism and capitalism is measured by the relationship between the policies of labour organisations and the vital institutions of capital (private property and labour market). Reform seeks to improve the economic system like it is. One neo-liberal reform, whose main goal consists in the “free market”, is quite different from a reform focused on progressive transition to social justice and job security. It is not a question of competition - “winners and losers”. It is a question of social justice and human rights, and the crucial factor for that change resides in the mobilized collective power of the workforce, which cannot be measured in economic terms. So, the governments and academic institutions that read these international reports should not to be so influenced. They should have in consideration the political and economical objectives that are behind them, and above all, that they have not passed through a democratic scrutiny. Indeed the scrutiny of democracy is important in assessing impersonal economic structures but let us not forget that Socrates was democratically and unjustly exectued. What is is even more crucial is the scrutiny of humanism and the preservation of one's humanity so that it is not man that serves the economy but the economy that serves man.